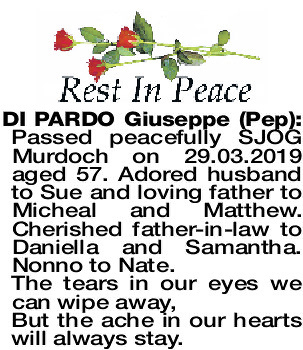 The Funeral Mass for Mr Giuseppe (Pep) Di Pardo of Palmyra, formerly of Maddington will be celebrated in Christ the King Catholic Church, Lefroy Road Beaconsfield, commencing at 10:00am on FRIDAY (5.04.2019). The cortege will leave the Church at the conclusion of Mass and arrive at the main entrance of FREMANTLE Cemetery, Carrington Street, Palmyra at 11:15am for a Burial Service. Vigil Prayers and Rosary will be recited in Christ the King Church, Beaconsfield at 7:00pm on THURSDAY (4.04.2019). 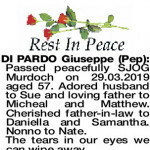 Passed peacefully SJOG Murdoch on 29.03.2019 aged 57. Adored husband to Sue and loving father to Micheal and Matthew. Cherished father-in-law to Daniella and Samantha. Nonno to Nate. But the ache in our hearts will always stay. 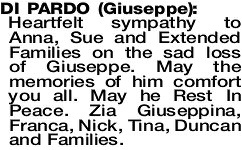 Adored son of Anna and Luciano (dec), loved brother of Maria, Lidia and Rita. Brother-in-law of Peter, Rino and Mark, and beloved uncle of seven nieces and nephews. We will remember and love you always. Rest in peace. Dear Nephew of Zia Maria Morasca. Will be always fondly remembered. You have a special place in my heart. Rest In Peace. 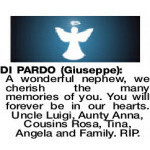 A wonderful nephew, we cherish the many memories of you. 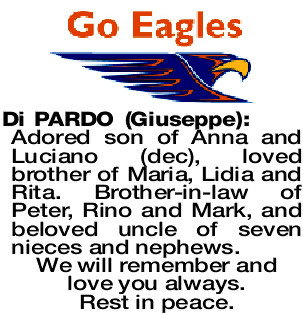 You will forever be in our hearts. 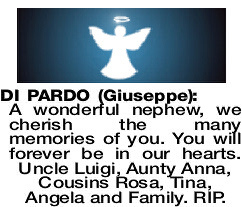 Uncle Luigi, Aunty Anna, Cousins Rosa, Tina, Angela and Family. RIP. Pep, you have been taken far too soon. You will be forever missed and never forgotten. Especially all the times we went out to the farms hunting. 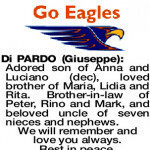 Rest in peace, Zia Tina and Zio Michele Canci, Rosa and Mark, Antonio and Genevieve, Domenico and families. 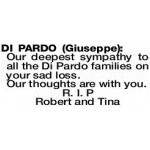 Our deepest sympathy to all the Di Pardo families on your sad loss. 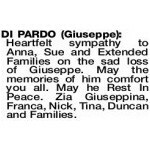 Heartfelt sympathy to Anna, Sue and Extended Families on the sad loss of Giuseppe. May the memories of him comfort you all. May he Rest In Peace. Zia Giuseppina, Franca, Nick, Tina, Duncan and Families. 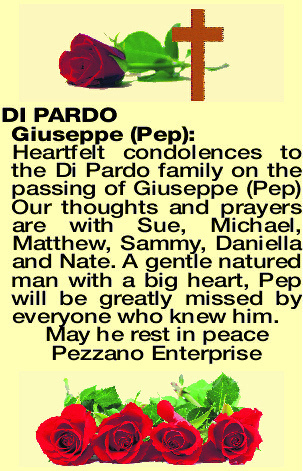 Heartfelt condolences to the Di Pardo family on the passing of Giuseppe (Pep) Our thoughts and prayers are with Sue, Michael, Matthew, Sammy, Daniella and Nate. 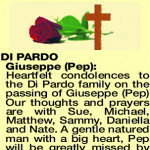 A gentle natured man with a big heart, Pep will be greatly missed by everyone who knew him. 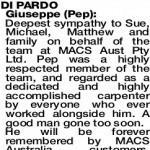 Deepest sympathy to Sue, Michael, Matthew and family on behalf of the team at MACS Aust Pty Ltd. 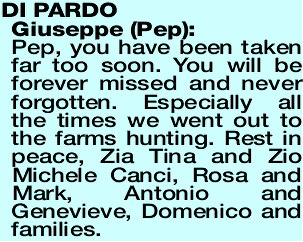 Pep was a highly respected member of the team, and regarded as a dedicated and highly accomplished carpenter by everyone who ever worked alongside him. A good man gone too soon. 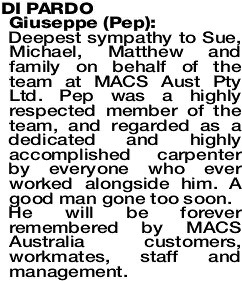 He will be forever remembered by MACS Australia customers, workmates, staff and management.